Automotive Collision Repair Market size exceeded USD 236 billion in 2017 and is estimated to exhibit over 2.5% CAGR from 2018 to 2024. The proliferation of automobile repair service centres focusing on increasing efficiency and operation productivity with the introduction of advanced materials including UV paints, carbon, and aluminium are boosting the automotive collision repair market demand over the forecast timeframe. The rising multi-branded authorized car service centres and auto body shops offering high quality servicing for customers at lower costs with suitable warranties is further supporting the industry growth till 2024. Increasing traffic congestion leading to road accidents and vehicle damage is driving the automotive collision repair market over the forecast timeframe. Increasing vehicles demand across the globe owing to rising preference for personal mobility and increasing disposable income will further expand the industry growth. Technological advancements including the usage of spectrophotometer for paint finish on cars along with automotive sanding systems offering premium colour finish further supports the automotive collision repair market growth till 2024. Manufacturers are focused on offering child parts of major automotive repair components for customer convenience and lowering of maintenance costs. Stringent regulations related to the health aspects of the workers associated with the automobile workshops is supporting the automotive collision repair industry expansion. For instance, NSF’s Collision Repair Shop Certification Program certifies and regulates repair shops, for complying with the industry standards for improved quality and long-term reliability of the products, supporting the revenue generation till 2024. However, increasing technical complexities in vehicles with the incorporation of innovative technologies including lane departure warning systems, forward collision systems, night vision, and automatic emergency braking may pose a threat to the industry players. The requirement of highly skilled technicians along with the high-end tools and equipment for car repairs may provide a challenge for the automotive collision repair market place. Industry participants are actively involved in addressing the challenge by encouraging new entrants into the industry. For instance, in 2016, The Society of Collision Repair Specialists launched multiple SCRS career centers for training technicians, conducting vehicle repair and maintenance operation. Finishing compounds showcased significant growth rate at around 4% over the forecast timeframe. Increasing traffic congestion leading to the risk of minor scratches and dents are supporting the segment growth. Further, availability of a wide range of compounds from several players at varied price range including rubbing and polishing will further contributes to the automotive collision repair market expansion till 2024. Others segment include spare parts, tools & equipment, dent removal tools, body shop tools, alignment systems, frame straightening, painting accessories, and welding equipment. The segment contributed to over 42% of the automotive collision repair market share in 2017 owing to the increasing damages to vehicles owing to rising traffic congestion. Further, proliferation of electric and hybrid vehicles is playing a major role in the segment dominance over the study timeframe. 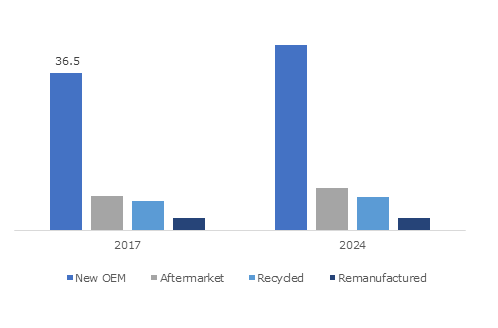 PCV segment in automotive collision repair market accounted for a revenue share of around 45% in 2017 owing to the increasing vehicle production across the globe. The rising preference of SUVs and crossovers along with availability of multiple vehicle models at lower cost further strengthens the automotive collision repair business generation till 2024. Automobile manufacturers are focusing on improving the car servicing experience by introducing premium lounge and other services for enhancing the overall customer experience. LCV market was valued at over USD 75 billion in 2017 owing to increasing usage of these vehicles across cities and rural areas for transporting goods. The compact size of these vehicles compared to the HCVs along with lower acquisition cost further supports the segment growth. The proliferation of e-commerce shopping portals along with the growth of doorstep pick-up and delivery services further supports the automotive collision repair industry expansion over the study timeframe. New OEMs accounted for the maximum revenue share of over 65% in 2017. The availability of high-quality spare parts and components along with the presence of highly skilled technicians are supporting the automotive collision repair market proliferation till 2024. The provision for extended warranties along with easier insurance claims is further strengthening the segment growth over the study timeframe. Aftermarket will showcase the highest growth rate at over 3% CAGR from 2018 to 2024. This growth is credited to the availability of spare parts and components at lower cost compared to the OEMs. Further, automobile manufacturers are now focussing on supplying their branded parts and components in the aftermarket. For instance, Maruti Suzuki offers its genuine parts across multiple MGA and MGP branded stores across India, boosting the automotive collision repair market share over the study timeframe. Dealer owned shops was valued at around USD 141 billion in 2017. This dominance is credited to the availability of a vast network of dealerships operated under the company with strict quality control. Further, the real time updates about the status of the vehicle repair and maintenance along with the provision for pickup and drop services further supports the automotive collision repair market expansion till 2024. Further, the increasing innovative features and technical complexities in vehicles require technical expertise in repair, further strengthening the segment share till 2024. Independent repair shops showcased a significant growth rate of over 2% CAGR over the projected timeframe. This growth is attributed to the lower labor costs for maintaining and repairing cars. Further, the increasing age of vehicles enable customers to repair and maintain their vehicles across independent repair shops and garages at lower cost, thereby boosting the segment share over the projected timeframe. Asia Pacific grew significantly showcasing at over 3.5% CAGR over the forecast timeframe. This growth can be attributed to the improving road infrastructure across the region. The presence of multiple automobile manufacturers including Toyota, Hyundai, Mitsubishi, Suzuki, and Tata offering multiple car variants across multiple price range along with improving disposable income across the region are supporting the automotive collision repair industry expansion till 2024. Europe automotive collision repair market size was valued at over USD 98 billion in 2017 owing to the increasing sales of vehicles across the region. Manufacturers are continuously investing in R&D to introduce newer vehicle models at lower costs further supporting the regional dominance till 2024. Further, routine maintenance part replacements including filters, wiper blades, and tires along with increasing average vehicle age is driving the service cost, thereby leading to increasing revenue over the study timeframe. 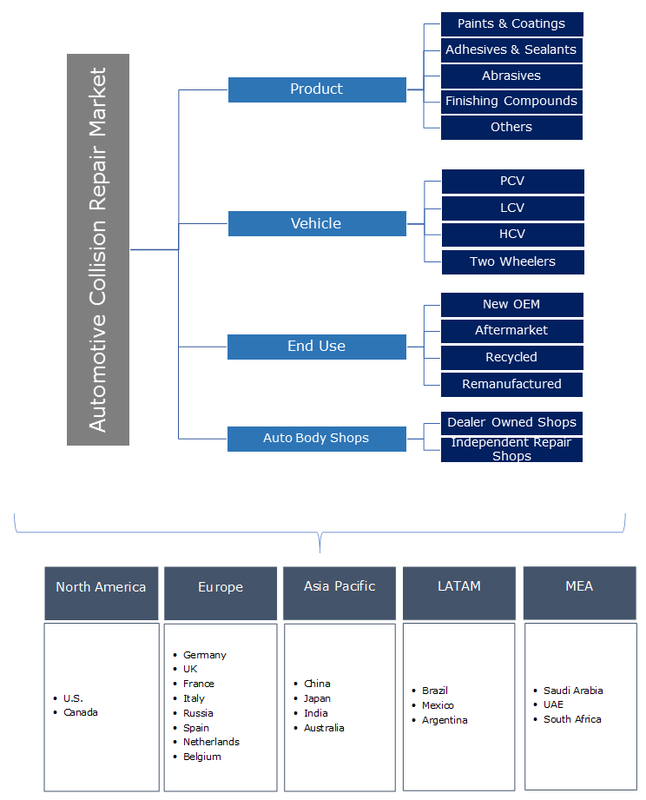 Few of the major players in the automotive collision repair market place include Denso Corporation, Continental Corporation, Federal-Mogul Holdings Corporation, 3M, Honeywell International Inc., ZF Friedrichshafen AG, Bosch and Faurecia, among others. New product development, after sales service, and product enhancement, are the prominent strategies adopted by these players to enhance their market share. For instance, in January 2017, 3M Automotive Aftermarket Division introduced the innovative line-up of pneumatic tools for grinding and cutting operations for offering reliable body shop operations with 3M Cubitron II for cutting and grinding abrasives. Automotive collision repair services include reprocessing and refurbishment of the vehicle components and parts damaged due to accidents. The automobile repair shops operate for ensuring the performance and safety vehicle after a crash. Industry’s revenue is primarily dependent upon routine spare part replacements and car accidents. Increasing technical and innovative electronics and sensors in new vehicles supports the expertise and investments that are required for handling the repairs, therefore limiting the reach of small & independent businesses. The industry comprises of various sales-valuation models including Do-It Yourself (DIY) packages for the consumers that prefer self-repairing of their own vehicles. Multiple retailers sell their components to professional auto service stations and restoration shops. Advancements in these technologies for ancillary products along with other services that include denting, body repairs, and painting will further augment the industry demand.